In an attempt to describe the active and action experience of reading, I took notes on my thoughts and streams of consciousness while reading The Unnamable by Samuel Beckett. I read the novel in three separate sittings. I usually read novels quickly, often finding myself intensely caught up in the world of the novel. This applies especially to nineteenth century novels. I’ve been able to read War and Peace, The Brothers Karamazov, and Crime and Punishment in a single sitting, but with The Unnamable I had to take breaks in my reading because of the overwhelming nature of the novel. Beginning the new novel was so daunting that even the name intimidated me. I had previously read a plurality of Beckett’s works, so I was aware of what I was getting myself into. During my reading of The Unnamable, I took notes on what my thoughts were at the time. 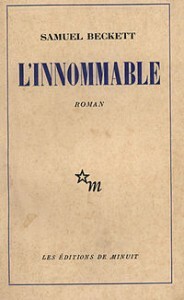 (From now on my transcription of my reading of The Unnamable will be italicized.) Beckett’s novels always plainly spell out the undercurrents of my own thoughts. As a modernist writer, rather than creating a world through his novels, Beckett instead uses his novels as a method of sorting out his own problems, as well as holding a mirror to those of the reader. From the moment I began, the words struck me. I read them in my head and I can feel felt the neurons in my brain jump to attention. ‘Where now? Who now? When now?’ I can almost see the black ink leaking out of the pages, waiting for me to soak it up with my fingers like a sponge. When reading I feel a need to absorb the text, rather than merely inhabiting its world. 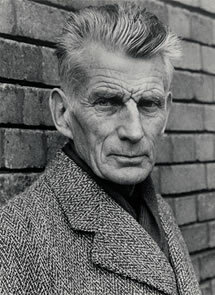 Beckett’s work is particularly conducive to this, because he doesn’t try to create a world that the reader can inhabit. He isn’t trying to tell a charming story that will distract me from the world. No. What he’s doing is redirecting my attention back to the world, and my thought/memory is my magnifying glass. He reminds me to check what I think and directs my mind, while I travel through with my own mind. However, too much time spent in this magnified world is a little overwhelming, so I occasionally stop for a cigarette, taking a break from staring at the thick black twists and turns on the page. I used Beckett’s own words as a diving board to jump off of into a stream of consciousness. He only tells the stories of these characters in order to aid his own view of himself. He says these are necessary for self-definition. Is there anything unnecessary for self-definition? How can one even tell? What good does it even do to self-define? Is that even the point? And even when one self-defines, or realizes oneself in one of these meaningless stories, how can one tell that one is supreme? There must be more than one. He keeps saying he’ll get onto serious matters soon, but nothing is serious. I shouldn’t even take his words so seriously. But I do. I take all literature seriously. I read the words of these authors, gasping through pages looking for the answer. I don’t really know what the question is, but if these men and women were able to write such things, they must understand something that I do not, and I wish to learn that from them. But even I know that there is no one supreme understanding, which is why I will continue reading and learn of every thing that I possibly can. But then again, nothing is serious, so why take it so seriously? My thinking begins to mirror his writing style, as each of his statements leads my mind to wander into my own life and reflections. Like Beckett, I keep backtracking and having to remind myself against dogmatism. But at the same time, I am still constructing a meaning with the help of the text, and any meaning that I do construct is whatever meaning the text could give me in that moment. I’m put in a strange state of feeling consumed by Beckett, yet the consumption is coming from inside me; I’m collapsing into myself like a black hole over and over again with every sentence he causes to gestate in my mind. When he stops putting paragraph breaks in the text, there stops being paragraph breaks in my mind. I follow what he is doing in my own fashion, and I take everything that I can see him offering me; even with the daylight I can feel myself falling into his own pit. And it’s alright. I know what’s down there and I want him to guide me through it. Now there are no more paragraph breaks. It is all a big chunk of stream of consciousness. I can feel that from now on there will be no more breaks in my mind or in his. You’re never not thinking about anything. Even pauses and nothingness are something. I guess this is not a change from how it was before, but something feels different. Like there’s something inescapable now about the mind and thought. He keeps changing the point of view over and over again. I cannot tell which character he wishes to talk about anymore. Not that it even matters. Beckett fills me with a much different type of exhilaration than Tolstoy and the difference in the texts leads to a different kind of construction. In reading Beckett, I’m suffering alongside him, the narrator, and every character he’s ever constructed. I felt an urgency to finish not because I want as much of the world as possible as fast as possible, but because I urgently want to leave his world behind and return to anything but it. If I were to put it down and take a break, it would only extend both our suffering. I wished to return to my own world where reality isn’t so concentrated as it is in The Unnamable. But once I surfaced back in my own world, I’m left with an impression of the entire novel upon my brain. I felt his words burrowing deeper and deeper into my brain, and as I had with War and Peace, I looked upon the world in rose-coloured-Unnamable-glasses. And the beauty of it is that both Beckett and Tolstoy are right. They are as different as night and day but they both say the same things and are both trying to talk about the same thing; the world. This entry was posted on Saturday, April 12th, 2014 at 10:32 pm and is filed under onValues. You can follow any responses to this entry through the RSS 2.0 feed. You can leave a response, or trackback from your own site.